Artwork Panel: 52.6cm x 98.5cm ≈ 20¾" x 38¾"
Silk/Brocade: 61.5cm x 154.6cm ≈ 24¼" x 60¾"
Reason for discount: Minor wrinkle along the top of the painting. 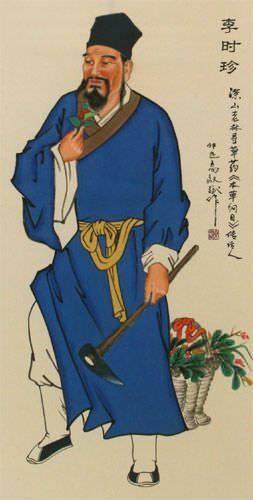 This is (Li Shi-Zhen) who is more commonly known by the title (Shen Nong), the Divine Farmer. This legendary man is credited with partially inventing and refining Chinese medicine some. Some say he is a figure of Chinese mythology. But many Chinese will insist he was a real man who, after trying many medicinal herbs (and nearly poisoning himself to death on 75 occasions) invented tea as a detoxifying remedy to poison in 2737 BC. Whether truth, fiction, or a composite of many, he is credited with being the father of eastern medicine thousands of years before western medicine was in its infancy. 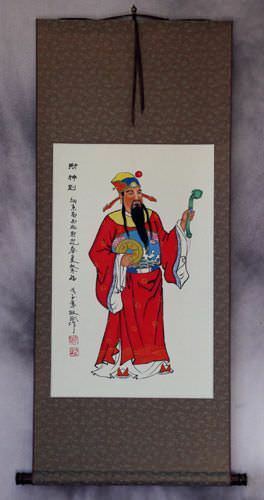 Some will refer to this man as "Holy Farmer", "Emperor of the Five Grains" (五穀先帝), and "Medicine King".